When a catchy phrase such as ‘Is Print Dead’ has caught your attention, you start to see it everywhere. Some see pregnant women and prams. I see print shops. In Thessaloniki, they were abundant. A struggling economy recovering from failing infrastructure and hardships for both businesses and private indviduals: Greece illustrates that print is still the carrier of civilization and growth. What is the best course of action when your finances are tight? Most people would answer: You cut back on your expenses. But that does not help you out of your demise, it just helps you stay in the mud without sinking any deeper. At least for a while. But what if you choose to grow your own money tree – or rather develop new ways of working that alter the course instead of treating the symptoms. In the case of a business – or a country – the way forward is not mindless cutbacks but disruption, innovation and finding those new opportunities. There is lots of room for improvement here, if you dive deeper into the European Commission 2017 Digital Progress Report which places Greece in 26th position (of 28 total) among European Union member states on the Digital Economy and Society Index (Greece is abbreviated EL). The answer seems obvious for anyone in the printing and business communications industry: We communicate and interact using the most efficient available channel of communication. In Greece, it seems, this is still print. Now, you would argue, service providers like print shops are quite often classified as SMEs and should be as severely impacted as their buyers. But printing is part of the recovery. Walking down the narrow streets of Thessaloniki, my eye caught the numerous book shops, magazine stands, and posters glued to the wall of every building that had some available wall space exposed to the people walking by. Flyers were stuck into the door handles of every apartment building every morning – and just as often removed by the inhabitants – replaced the next morning with a new message, a new service, a new special offer of the day. We were offered flyers, brochures, political pamphlets. And every 5th-10th shop was a copy shop, a small or medium sized print shop, digital or offset printing. There was a whole street with only print shops on top of the yet to be excavated ruins of Galerius’ Byzantine palace. And TYPO in Greek means what we think it should mean. It’s not the print that is disrupting or helping Greece back on its feet, but it is the carrier of the messages that those who change, innovate and grow need to spread in the most efficient way available to them. If you are a small startup, if you are medium sized retail or manufacturing business, you cannot pay for expensive online advertising or TV ads. If you are a small non-profit or political movement funded by enthusiastic supporters, you cannot reach the masses through digital media alone. You spread the news on paper. Because paper is durable, flexible, ubiquitous. You can leave it on door handles, hand it out to people in the street, glue it to the walls of popular sites, send it as post cards, sell it as books. It does not disappear with the wink of an eye – or a click of a finger on a scroll button. It still does not guarantee that your message is read or your acted upon. That remains the task of the content provider to ensure. But it certainly reaches your audience, if you know where to put it. Looking for correlations between airline social customer service and growth. The social media manager of an airline or airport has a challenging job dealing with complaints, bookings, questions about all and sundry … and emergencies. It’s not a nine to five job – it’s a 24/7 task for a social media manager at airlines and airports. People have questions and need help anytime, anywhere. Including when stuck in elevators. When it comes to monitoring and responding, in some cases it’s a life-or-death situation. I hope, Amanda Carpenter survived the ordeal of waiting from Feb 14 until Sept 7 in an elevator at the airport before somebody on the social media team responded to her tweet. Oh, and Ms. Carpenter is not just anyone – she is an accomplished CNN contributor. Not that this matters – regardless of who you are, if you need help you should get it while you are still breathing. Knowing her to be a journalist, I seriously hope this was only a test to check the response time of @Amtrak – but you never know. Airlines and airports – as well as many travel & leisure providers – are industries where a Twitter conversation is an important channel for customer interactions. So, in 2013 I wanted to find out how and if these industries had embraced this opportunity on improving customer satisfaction and grow their business despite a challenging market situation. With the help of Datasift, we analyzed the response time on Twitter of 33 different airlines worldwide over a period of 30 days. At the time – 2013 – there were more than 100,000 tweets from customers mentioning the airline either directly or via hashtag. If ran today, the numbers would have multiplied. At least that’s the prevalent argument. Social media was about sharing and engaging with family and friends – who in turn influence our buying decisions. This was the major argument in favour of companies investing in these channels. And 3 years later it’s still up there as one of the reasons CEOs invest. So, I asked my family, friends and wider network eight short questions about whether they had ever tried to contact an airline via social media, whether the airline responded, and whether you were satisfied with the response – leading to a positive customer experience. And repeated this survey in 2016 to see if things had changed. It is often said that it is almost impossible to reverse a bad reputation, which United Airlines has felt ever since it lost the famous guitar. But it is possible to build a great reputation as American Airlines has done, and jump 33 points on the J.D. Powers customer satisfaction index for airline industries. Simply by focusing on social profiles and social interactions. American Airlines started running regular workshops with their staff teaching all customer facing employees how to navigate in the social media space and to pick up trends and grumbles before they turn into storms. In 2013 they were rated below average – three years later they had climbed the ladder significantly. Twitter – a marketing channel or a conversation? This graph shows the response rate versus customer interactions for some of the airlines in the study. You will want to look for the white space – the gap between the organge response line and the yellow staples signifying number of customer mentions either directly via their Twitter profile or in hashtags. The whiter, the better. For my analysis, I picked those airlines respondents had mentioned. 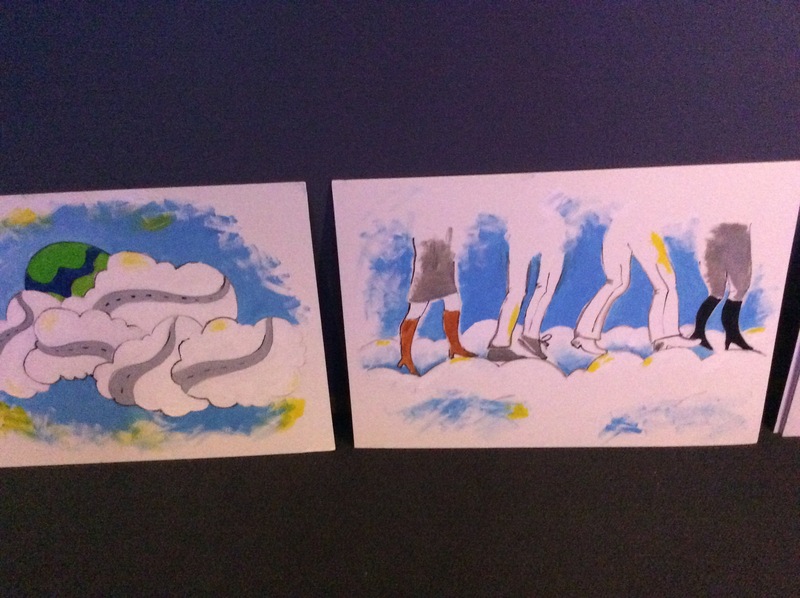 Lufthansa was among those who were very present on Twitter showing promotional images of their aircrafts engine power, happy pilots and stewardesses, and pictures of the clouds in the sky. But for customer service, in 2013 Lufthansa referred people to download a detailed form on their website, and fax (!) or email it to their customer service centres. Air travel remains for many people an uncomfortable, disappointing and grumble-worthy experience. Things have changed both for Lufthansa Group, American Airlines, United Airlines, and to some extent British Airways. But the grumbling persists. As with United Airlines and the lost guitar, the reputation of British Airways for non-supportive customer support remains a stigma. And the execution for both airlines appears still to be slightly lagging at least according to the 46 responses on my little survey. Is there a correlation between focus on social customer service and growth? Imagine if you could simply take these findings directly into the board room and demand more resources for your social customer service initiatives. Unfortunately, it would require a lot more detail and a larger survey sample to draw any conclusions worthy of that, but the financial results before taxes and interest for some of the noteworthy airlines from the original study show some trends, especially if related to growth in passenger numbers. KLM is famous for it’s pioneering efforts in engaging customers on Twitter with their many innovative ideas. But this analysis cannot illustrate the impact, if any, because they had since merged with Air France. But they are both on the top ten index of the world’s best airlines, so it can’t be all wrong. Similarly, Lufthansa Group now comprises Swiss who already then were performing well in the response rate plus acquired several more in the interim years. We shouldn’t jump to conclusions. Even obvious correlations may be false friends. In 2000 there were 327 deaths by people entangled in their bedsheets and per capita cheese consumption in the United States was 29.8lbs. This has grown to 717 deaths and 32.8lbs of cheese by 2009. A clear correlation over the years. Enjoy more of these obvious and very funny correlations by Tylver Vigen here. What I am trying to illustrate with the cheese in the bed sheets is that we cannot draw any conclusive data from the social media engagement rate and the financial results or passenger growth in the airline industry. There are too many additional data points that influence or need to be filtered out. It requires more computing power than I have available. But it would be an obvious task for some of the now very hot artificial intelligences being launched by many IT vendors. What if I could ask IBM’s cognitive intelligence Watson to do an analysis? I did in fact ask Watson about something else – stay tuned for my next blog post on the Kobayashi Maru – or how I convinced Watson to change its impression of my Twitter personality. Take a look at @echrexperiment on Twitter to see how I did it. So, is there a correlation between a company’s financial growth and turnover and how socially engaged they are in their customer service function? Sorry, if this wasn’t helpful. If you compare customer satisfaction index, the financial results before taxes and the passenger growth of these airlines in 2013 adding the filter of how they were rated in engagement on Twitter with their 2016 results and growth, all of them have grown. But not necessarily because of their satisfaction ratings or social media engagement, but due to other strategic measures such as mergers, geographic focus, improved fleet etc. The numbers provided in the below chart are based on the annual reports and official websites of each of the airlines comparing 2013 with 2015. On this chart one airline stands out with negative growth in passengers and the lowest financial growth 2013 – 2016 on results before taxes and interest. But it is also one of the most Social Airlines in terms of response rate. Scandinavian Airlines Systems was facing bankruptcy in November 2012. Media reported hourly on the negotiations between trade unions and SAS leadership and executive board. They were trying to agree on terms that would make SAS more competitive and allow the airline to bring in more capital to avert the crisis. Meanwhile, over the course of that week, travelers were deeply worried. But SAS had a social media strategy in place already. Following the infamous volcanic ash cloud closing down airspace in most of Europe in 2011, they had kicked off their social media channel with a focus on providing active assistance and service to their passengers. During that dramatic week, one social media manager in particular – Cecilia Saberi – stood out with her calm and constructive responsiveness, her quiet charm with a twinkle in her eye. She worked day and night, slept on the sofa in the office for a few hours only to resume responding to concerned passengers, media and sensationalists. Her approach was sincere, open, genuine and fact-based. And she showed with every comment, every tweet, that people interact with people, not machines or corporations. SAS did not lose their passengers during that week as far as is known. Because business continued as usual in a very unusual situation. As is often the case, despite sensationalist media reports creating issues without proper attention to facts. As you can see from the below Skytrax 2015 airline ratings, customer satisfaction does not necessarily lead to better financial results or more bookings. But during a crisis, loyalty and genuine openness and care – including responding while the response is still helpful and not leaving a journalist in an elevator for 6 months – can make the impossible possible and turn around a potentially disastrous situation into even better experiences. Cecilia no longer works for SAS – but how she interacted has become the style of the social media team and is well appreciated by the customers. The seats may be shaky, there is no silver ware in business class, but Scandinavians remain loyal a little longer while SAS gets itself sorted. Companies like Microsoft have many types of customers, but by embracing cloud they have multiplied their impact on IT’s everyday dilemma – the rogue customer. Meet the customer where the customer is – a truism pervasive to sales and marketing speak over the past few years – is now also the overall motto where IT meets business. The Microsoft Cloud offers customers a global infrastructure with 30 available, and 36 announced, datacenter regions. Microsoft CEO Satya Nadella just confirmed this commitment on Oct 3, 2016 by adding several European countries to the list of countries hosting or acting as hubs for their datacentres. And by introducing a novel concept where access to customer data is controlled locally through a trustee – T-Systems International in Germany. Thus addressing the continuous resistence to placing and handling data outside of your jurisdiction which is particularly fierce in Germany. This linear layered view of computing vs cloud as illustrated by industry expert R Wang in 2010 was a nice illustration of where the -as-a-Service had disrupted traditional IT – but this no longer applies: It is being disrupted by the citizens=users themselves. James Staten is a visionary. As a former Gartner and Forrester Analyst and ex-CMO he is an expert at connecting the dots and creating a cohesive narrative. To understand the reason why Microsoft believes in the hybrid cloud and is leaving the focus on -aaS combinations, you need to understand who your customers are and under which assumptions they operate. Historically, IT called the shots when business needs were met in the enterprise. And even structure lovers like myself, can see that what the architecture of today’s large enterprises mostly resembles is a maze. But with today’s tools at their fingertips, customers want to do their own thing. And the challenge is on the IT management to keep it safe and secure despite everyone going rogue on them. When basically everyone can or can learn to code, or at least subscribe to cloud based business process applications they could deploy themselves, the infrastructure has been disrupted by user behaviour. Just like a path created by people simply trying to find an easier way. James Staten feels that if you support the developers by providing them with the tools they feel comfortable with as they navigate safely in the Cloud, you are also helping IT to stay in control of their infrastructure and protect their investement in existing platforms and processes. This is where among others the Microsoft Azure Security Center wants to help IT managers sleep at night. When you meet people like that, who have visions that reach beyond and above, you should always remember that they are people who want to make the world a better place – in this case, James Staten even held my phone when we took the traditional SpeakerSelfie – and I am still slightly shaken by the encounter. Hope to meet again soon at another conference somewhere in the universe to continue our conversation. < Disclaimer> Image has no connection to the interview topic or person interviewed. Are banks big, impersonal and greedy? One of the key ingredients to success is to simply listen and engage. This quote by the renowned entrepreneur Gary Vaynerchuk, revolves around how social media has brought back the necessity for and possibility of the “small town shop” mentality. It’s the old fashioned approach to customer service: you walk into the butcher shop, and the owner greets you by your name, knows your aversion to pork, and realises the reason for your visit must probably be the big splash barbecue extravaganza next weekend. What Vaynerchuk really means is that companies are starting to care more. By opening up to customer issues, complaints and different ways of life, they are better suited to provide a heartfelt service that makes sense on a 1:1 level. By caring more these companies will deliver a service that will be sought after. In return they will increase their competitive advantage through the power of word of mouth. Because these days, the customer is armed with the weapon of mass communication that can be used for or against you! Let´s take banks as an example. These often very conservative institutions are facing important market changes really evoking a need for rethinking their strategy for business growth. One of these changes is the mere fact that the confidence towards the banking sector as such is heavily decreasing. 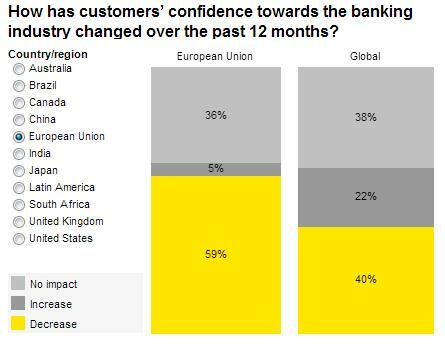 According to Ernst & Young (Global Consumer Banking Survey 2012) 59 % of the EU respondents find their confidence in the banks decreasing. 59 % who lack confidence – that´s a huge blow to an industry! 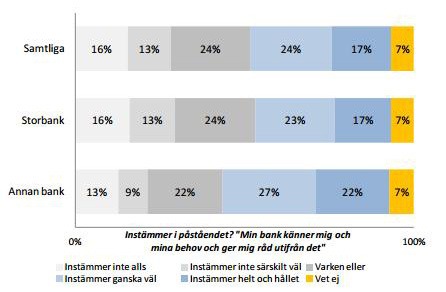 In Sweden, Länsförsäkringar recently performed a study asking 3,500 customers about their views of the banking today. A major finding was the perception that banks are putting their own interest over the ones of the customer. Only 4 out of 10 respondents felt that their bank knew them and provided advice based on that knowledge. 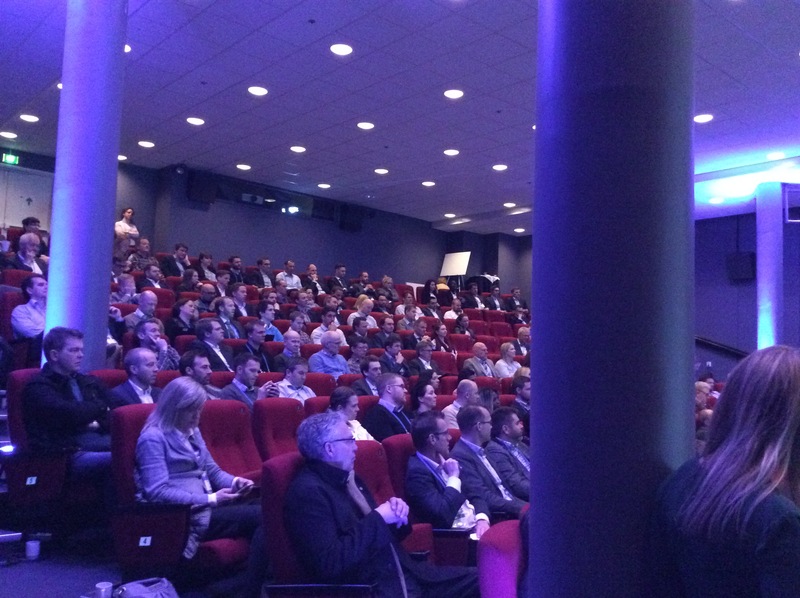 In summary – the banks are still considered to be big, impersonal and greedy. You could also look at banks as you would at a guest at your dinner table. 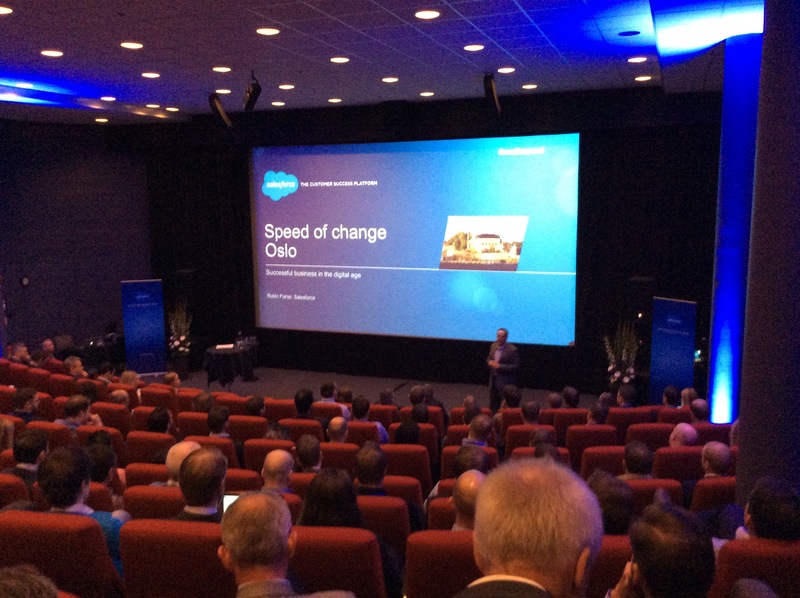 For a study last year, salesforce.com took a closer look at the “personality” of banks together with Psykologilabbet, a psychology practice in the forefront of psychology research. The study was based on the how banks are choosing to describe themselves, but more importantly how they are being perceived by the outside world (via media, blogs, forums etc.) 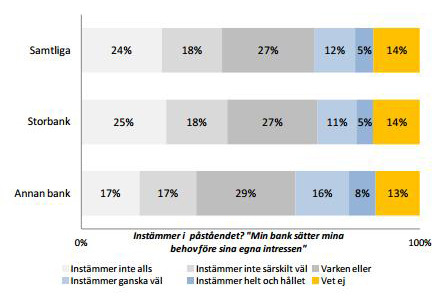 Psykologilabbet studied banks in the same way they would an individual – ranking them according to some key criteria that in total makes up a strong character (and a pleasant dinner guest) – credibility, respect, responsibility, fairness, caring and citizenship. 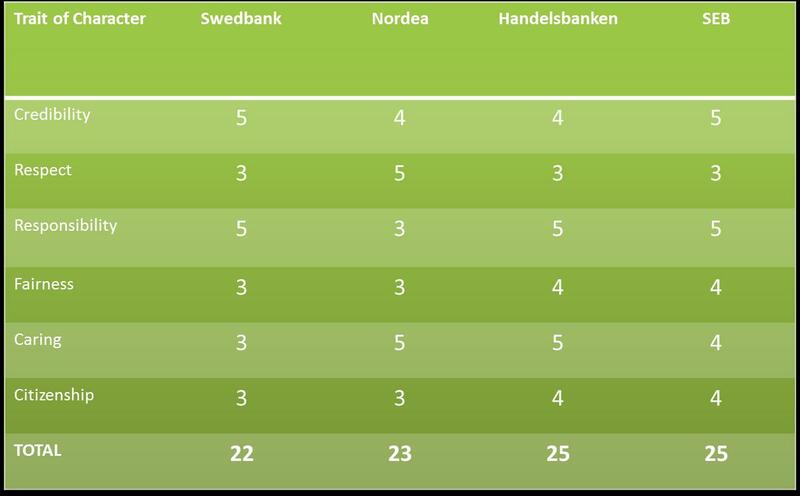 This study showed that although the Swedish large banks are perceived as relatively credible, they overall score low in traits such as respect, fairness and citizenship. All this, combined with the ease of customer taking their business elsewhere should make some of these institutions rethink. The banks paving the way and getting on board with the personalised, value adding approach will have a better shot at winning the race. In Australia, the Commonwealth Bank, has managed to stick out in the fierce competition through understanding that the relationship with your customers need to be based on getting back to basics – engaging in conversations that bring value to your client. Going back to my butcher example – “I have just the right piece of strip steak for you, and if you like to get it perfect medium rare leave it alone for 9 minutes on one side and 7 on the other”. Commonwealth Bank understands that the client´s financial world really isn´t hapenning inside the bank office: It´s when you are out and about and see a house you´d like to buy, or when drafting your exciting business plan and need to quickly grasp your funding opportunities. The personal, financial conversation you would have with your bank contact therefore needs to get extended to that world – without losing the value factor. By running the business on a platform allowing for collaboration, the services provided become relevant to every customer. You see a house you like? Take a picture, the bank compiles the information needed, and the loan gets approved while on site.